In general, I don’t really have an opinion on measuring spoons. I definitely would not consider myself anti-measuring spoon; but I’m not particularly pro-measuring spoon either. In fact, I didn’t know anyone could be pro-measuring spoon. Apparently, I was wrong. Turns out people are VERY pro-measuring spoon. Or, at the very least, very pro-these measuring spoons. You’re looking at an aggregate 4.8-star rating right there. Eighty-eight percent of those 1,800 people gave this a perfect 5 out of 5 stars. That’s nearly 1,600 people! 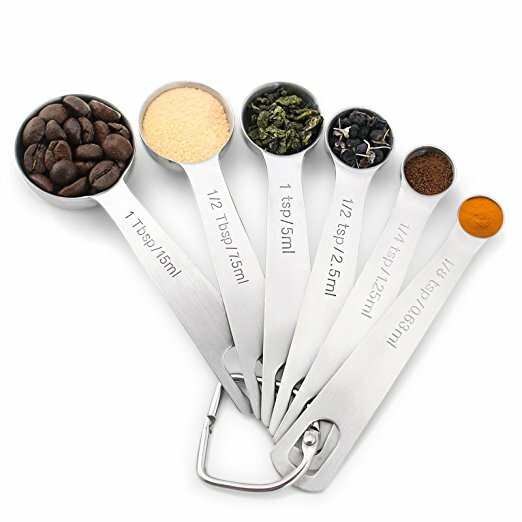 What can I say, people LOVE this set of 6 stainless steel spoons (1/8, ¼, ½, 1 tsp, ½, 1 tbsp). And I imagine those hundreds and hundreds (and hundreds) of people would be even MORE pro-these measuring cups, if they knew they were 60 percent off.